• Songs specifically designed for you to use with your baby. • Clear and easy-to-follow signing instruction. • Reinforces many of the most commonly used baby signs. • No previous signing experience is necessary to use these fun songs. • Based on research demonstrating that babies can understand and communicate at a very early age. We Sign™ Baby Songs is part of the integrated family of award-winning DVD’s and Sign to Speak Books. 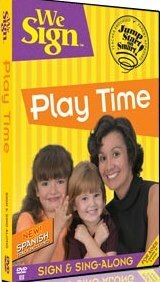 Your child will grow with this captivating series and will experience their very own Jump Start on Smart.